There are currently four consultations on guidance documents that have been developed in preparation for the implementation of the Clinical Trial Regulation (EU) No 536/2014. The MHRA GCP Inspectorate encourages you to take time to review these. Following the EU referendum, MHRA continues to play a full, active role in European regulatory procedures. The UK is assessing the potential impact on our regulatory framework of the decision to leave the EU. At present, we continue with our programme for implementing the Clinical Trials Regulations and we remain an EU Member State with the rights and responsibilities this entails. "Summary of Clinical Trial Results for Laypersons". Don’t miss the next post, sign up to be notified by email when a new post is published on the Inspectorate blog. Access our guidance on good practice for information on the inspection process and staying compliant. Great post i must say. Thanks for sharing . Keep posting. 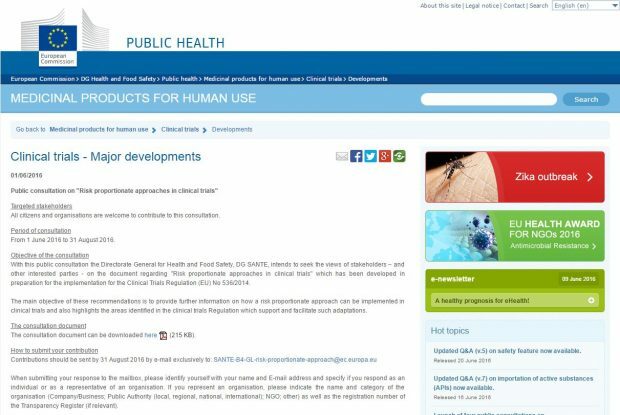 This blog shares the work of the Medicines and Healthcare products Regulatory Agency (MHRA) Inspectorate, by inspectors and those the Inspectorate works with. You can print blog posts using the keyboard shortcuts "Control P" or "Command P".